The Janome sewing machine 4623 has the features you need if your sewing time is at a premium. The Janome 4623 sewing machine has the features you need, hard cover and storage compartment under the top lid holds extra presser feet and accessories. 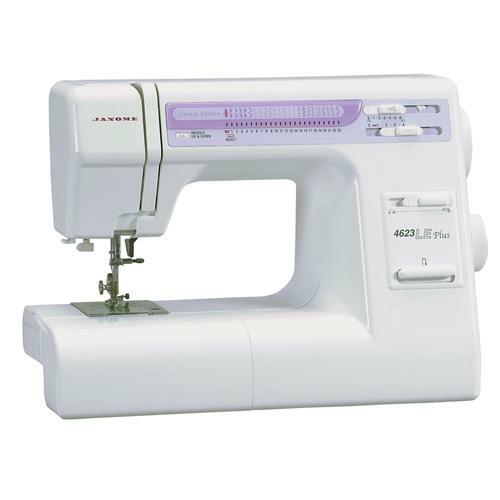 The Janome 4623 is a solid quality alloy body machine with top drop in bobbin with rotary hook, with view through cover, which makes it ideal for heavy work. "Needle Up Down" is great for quick pivoting. The speed control lever provides precise, consistent speed control. The one-step buttonholer stops automatically upon completion. Extra penetration power and the 7 piece feed dog provide consistent performance on all types of fabrics. A storage compartment under the top lid holds extra presser feet and accessories. Janome 4623 sewing machines Top drop in bobbin with horizontal full rotary hook. Jam proof and thread is visable through see through slide plate.